Despite blistering heat and a supposed new air-con load, Australia’s electricity market wasn’t pushed very hard at all this past summer. So what’s going on? In Queensland peak demand was the lowest in five years, down 450 megawatts or almost 5 per cent on 2012 levels. 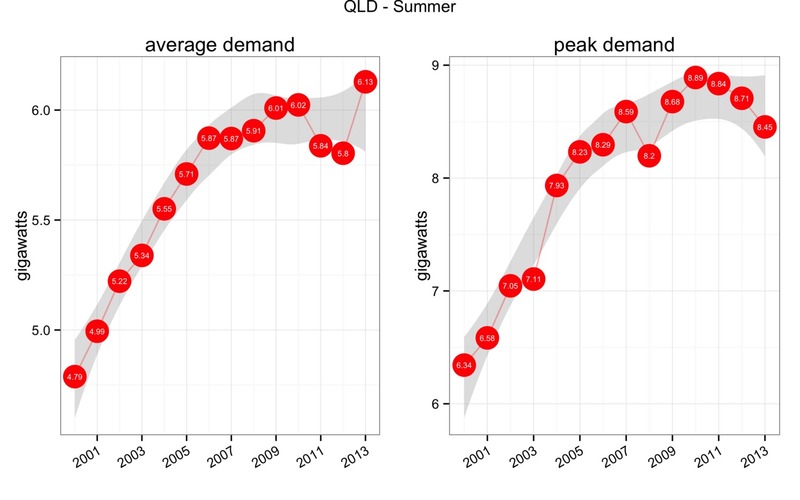 Average (left) and peak (right) QLD summer demand. Data from AEMO, image by Mike Sandiford. 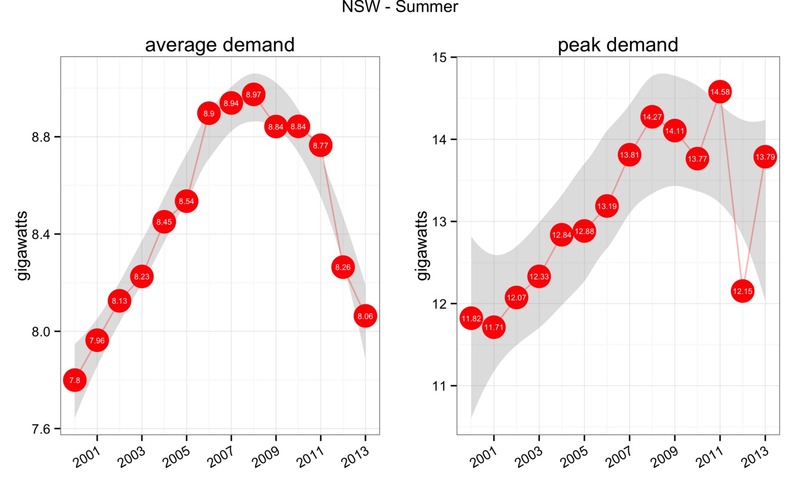 In New South Wales peak demand was up a massive 1.6 gigawatts from the previous summer but that was no great achievement, since the 2012 peak was the lowest since 2002. In fact the New South Wales peak this summer was almost 700 megawatts below 2011, and came in at only the fifth highest on record. Average (left) and peak (right) NSW summer demand. Data from AEMO, image by Mike Sandiford. In Victoria, peak demand came in at 9.1 gigawatts, some 12% lower than the 2009 record of 10.4 gigawatts. 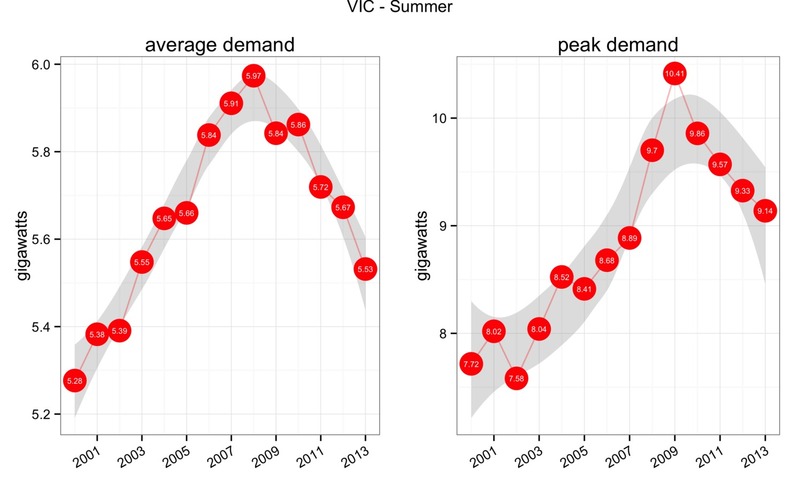 Average (left) and peak (right) VIC summer demand. Data from AEMO, image by Mike Sandiford. To put these numbers in context we need to take step back in time. Up until about 2008, peak demand was growing at around 3% each year. So back then the expectation was for peak demand to rise another 15% or so by 2013. In Victoria that meant planning for a 2013 peak demand of around 12 gigawatts, some 25% higher than we actually achieved. The situation is not much different for average summer demand. In Victoria average demand was down 140 megawatts to levels not seen since before 2003. New South Wales was down 200 megawatts to levels not seen since before 2002. In contrast, Queensland did set a new record for average summer demand, up 100 megawatts on the previous summer average high of 2010. One obvious contributor to the general decline in demand for electricity dispatch by the NEM, and the lack of extreme peaks, is solar PV. Because domestic solar PV is used locally, it reduces demand for electricity dispatched by the NEM across the poles and wires. And because solar PV capacity has been ramped up so quickly, the way it is impacting is readily assessed by comparing this summer daily average demand profile to that of a few years ago. When we do so, the signal of solar PV becomes blindingly obvious, especially in South Australia and Queensland where the domestic solar PV penetration is highest. As shown below, the parabolic day-time reduction in demand centred on midday is a strong signal of the way solar PV is impacting by cutting more than 10% off midday summer demand in South Australia compared with the summer of 2010. It is also skewing the average demand profile, making it more peaky in the late afternoon, as air-conditioning adds load while PV diminishes in output. It is also clear that solar PV has helped shave some of the peak load, which up until a few years ago was occurring at around 3 pm, and is now pushed back to lower levels, later in the afternoon. Average summer demand profile by time of day for SA. The left panel shows absolute demand for the last four summers. The right panel shows the percentage change relative to the summer of 2010. Data from AEMO, image by Mike Sandiford. In South Australia, where about one in four houses now have solar PV installed, there is still capacity for a lot more. It’s salient to ask what would happen to electricity demand if solar PV penetration reached 50% of houses. 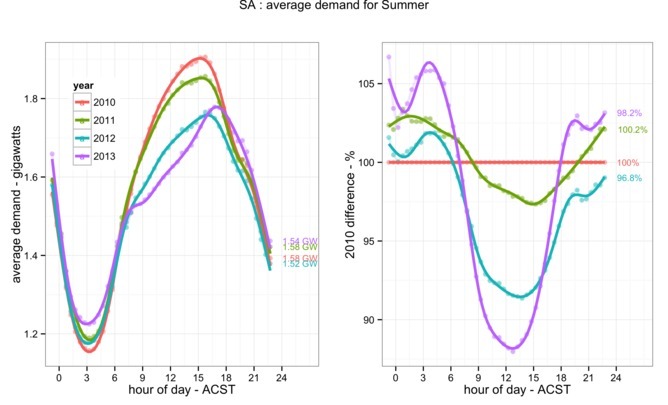 What it would do, as indicated in the Figure below, is take midday demand down to near the lowest in the 24-hour cycle, effectively creating a second off-peak demand regime. 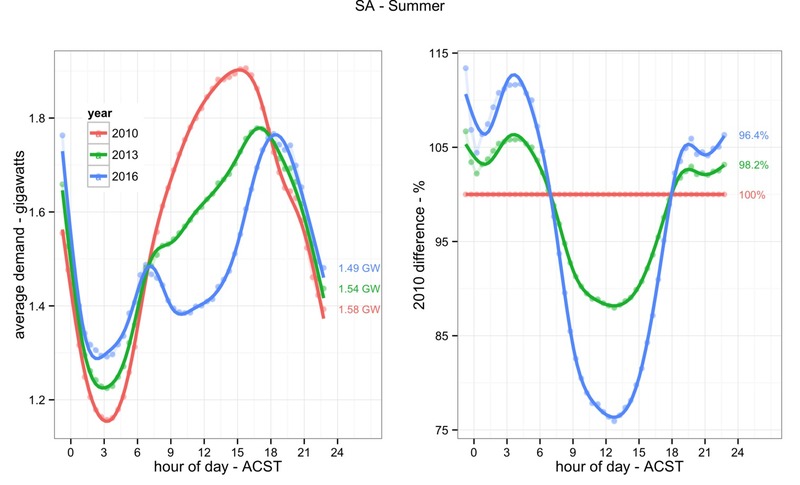 Projected average summer demand profile by time of day for SA, consistent with a doubling of PV installations out to 2016. The left panel shows absolute demand for the last four summers. The right panel shows the percentage change relative to the summer of 2010. Data from AEMO, image by Mike Sandiford. Catering for two off-peak periods would make for a big change to our current thinking about how we supply affordable poles and wires electricity to meet the needs of just a few hours of high demand at the beginning and end of each day. Mike Sandiford is Director, Melbourne Energy Institute at University of Melbourne. He does not work for, consult to, own shares in or receive funding from any company or organisation that would benefit from this article, and has no relevant affiliations. You need to be cautious about jumping to conclusions in energy markets about perceived observations and their cause. i.e. “one obvious contributor” but no others are mentioned. As an example, the average demand in NSW over summer has dropped 200MW year on year as shown in the charts. What is not mentioned is that Kurri Kurri smelter in NSW closed in October. If you look at this article(http://www.climatespectator.com.au/commentary/kurri-kurri-smelter-hydro-s-polluting-problem-child) you can arrive at average energy use of 400MW. This means that underlying summer demand increased year on year in NSW. The hot day picture of the impact of Solar PV would be more interesting if we had some useful demographic data on the households concerned. For example, if the homeowners are at work then, presumably, their Aircon is not running. Thus their contribution offsets the households with people at home with the Aircon on. Families and the retired tend to be at home during the day but with 2/3 of adults in the workforce, the so called dormitory suburbs are probably compensating for the rest. Empty houses with PV on the roof are providers of power not reducers of demand. We need to know by how much. Nothing is simple, so we should also add a couple of complications. For example evaporative Aircon works well in dry climates like inland; NSW, QLD,and Vic, while metro SA and WA are pretty much optimal for it. So we also need to know what proportion of homeowners have this sort of Aircon when thinking about the impact of Aircon more broadly. Its also apparent that for most of us the hottest days are usually accompanied by hot winds. If this is the usual case, then we need to calculate the impact of an increased contribution from wind. Not only should it act to meet increased demand but the SA experience seems to show that it can dampen peak prices for electricity at the same time. Finally we have both a geographically spread National Grid (well for one half of the continent) so the more disbursed both wind and PV are, the more reliable they are and the greater their impact on peak demand – not only reducing it but widening the period of its impact. Thanks for putting this together, Mike. It’s very interesting, especially given that Australia’s population is still gradually increasing and that our economy is simply fabulous compared to the rest of the developed world.